Hildegard is the most beautiful woman to ever wear a helmet. Most men look dashing and powerful in these but not all women can carry the helmet look. 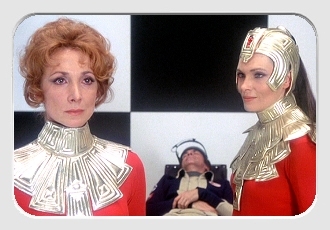 I thought Liana Orfei in HERCULES, SAMSON & ULYSSES was the best but after re-watching the film last night I realized that this and also her performance in a SPACE 1999 episode (image) in which she wears a costume with a Roman-inspired helmet puts her on top of the list (which I should do one day). Yes Hildegard looks terrific here - she is Mrs Brian Blessed in real life, their home life must be fun !